Fr. 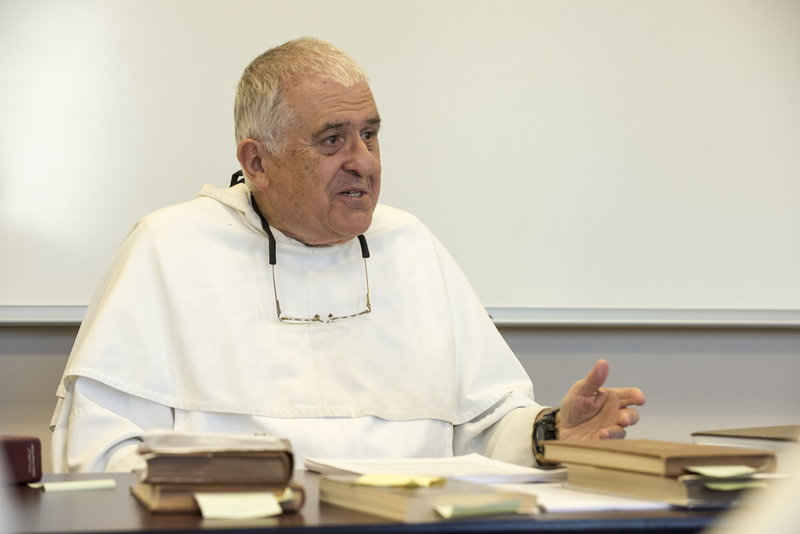 Basil Cole, O.P., teaching theology at the Dominican House of Studies. Ordained to the priesthood in 1966, Fr. Basil Cole has taught moral, spiritual, and dogmatic theology at the Dominican House of Studies since 1998. He has written extensively on moral theology and is the author of Christian Totality, a widely translated volume on religious life. How do your classes help form future priests? Sacred doctrine, once understood, inspires a person to follow Christ Jesus more profoundly, more devoutly, and with more aliveness. That, in turn, stimulates the priest to be a more fervent and intelligent preacher, teacher, and even administrator. And to do it with a sense of mission: that he represents Christ the Head, Christ the Bridegroom, Christ the Leader, Christ the Representative of God the Father. How does the contemplative life influence preaching and teaching? St. Thomas says clearly that our preaching and teaching should flow from the gift of the Holy Spirit, whereby we taste some aspects of the mysteries of the faith. Therefore, tasting the mysteries of the faith doesn’t come from human nature alone, but from the presence of the Holy Spirit in the soul, from the gifts of the Holy Spirit being activated, and from studying and ruminating over the truths of the faith so that they become meaningful to the friar preacher. What are your hopes for the next generation of Dominican priests? I hope they will bring a freshness of thought, creativity, and action, and inspire others to follow Christ. Our purpose, as with all Catholics, is the salvation of souls. Professors in the House of Studies are like architects who give the plans to the contractors who are going to be building the temples of God in souls. My hope is that our priests will make great buildings in people: strengthen their faith, hope, and love to have better marriages and a better sense of the vocation to holiness in the workplace. Your generosity enables the Dominican Order to pass on faithfully the truths it has transmitted for over 800 years!